Walk to the corner of Spring Garden Road and Barrington Street, and it’s safe to that you are in one of the most historical parts of Halifax. On your right is the Old Burial Ground, and directly across the street you have St. Matthew’s United Church founded in the same year as Halifax, 1749, and the oldest United Church in Canada. That’s where I am taking you today, on week 362 (3/15/2018) of Travel Photo Thursday. The church that stands today, an outstanding example of Gothic Revival architecture, is not the original, which burnt to the ground on January 1st, 1857. There is nothing pretentious about the interior. I’m not sure that I’d want to sit in one of those pews for very long. However, had you been a wealthy member of the congregation back in the 1700s, the best pews rented for the tidy sum of $144.00 annually. You would have also found the church to be unheated. Churchgoers wore so many layers that it was next to impossible for them to walk. Wealthy churchgoers had their servants carry in iron foot warmers with live coals! If you believe the historical lore, there were three female parishioners who brought their fat poodles to service to use as foot warmers. 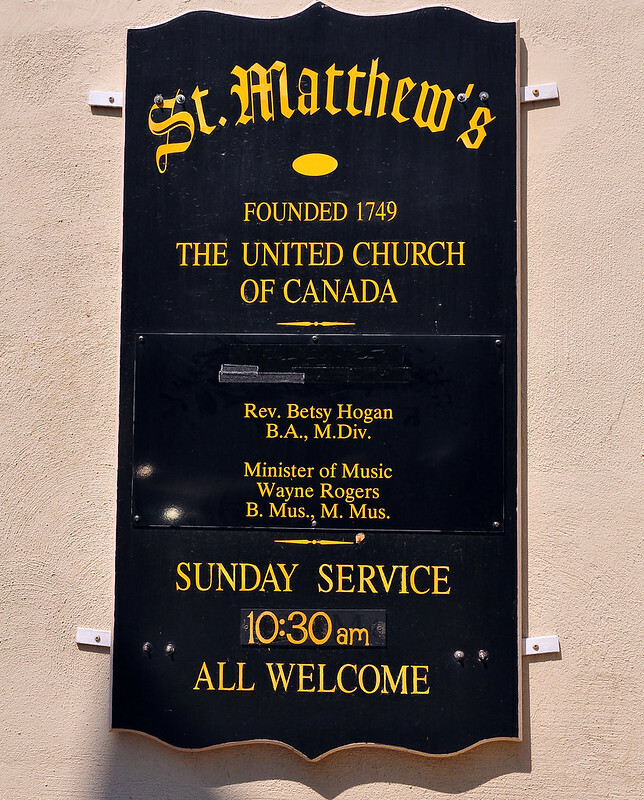 In 1795, I am sure to the relief of much of the congregation, a stove was finally installed at Saint Matthew’s United Church. 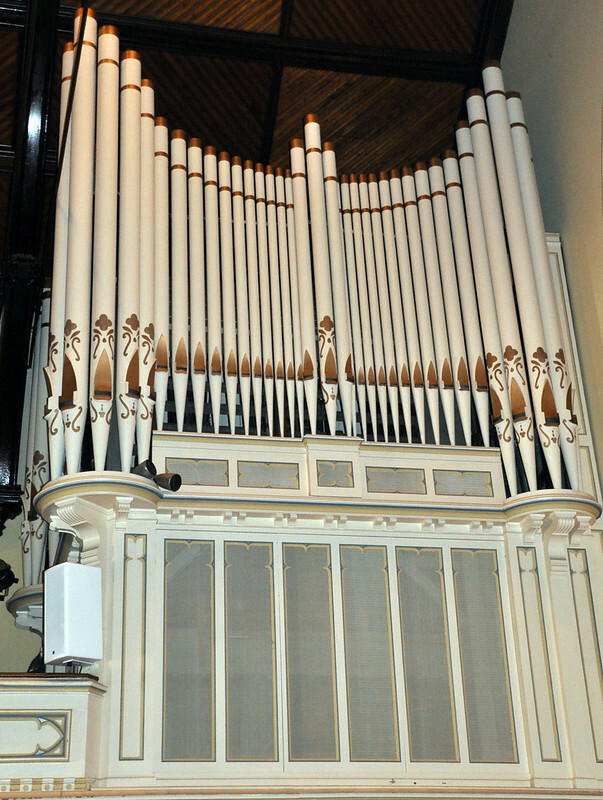 The church boasts a Casavant pipe organ, originally installed in 1921, and totally refurbished in 1998. Music continues to play an important role in the church. In addition to Sunday services, there are regular concert performances. On Tuesday evening Nova Scotians experienced the 3rd nor’easter in 5 days. Wind gusts, up to 128 Kilometers per hour, battered much of the province. Sadly, St. Matthew’s church steeple was a casualty, toppling down early Wednesday morning. I’m not in Halifax, so I don’t have a photo to share. Here’s a link to a CBC news article chronicling the damage. The top photo is St. Matthew’s United Church shattered steeple. I see it as a grim reminder that Mother Nature can hit anywhere, anytime, and age and history aren’t immune. I have no idea what the future will bring for the church and the steeple. 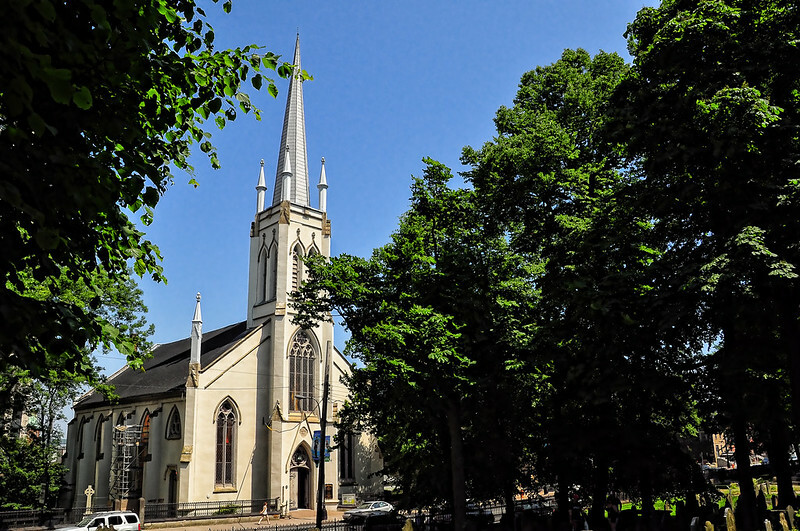 I’m hoping the steeple will be rebuilt, and the church will continue to be an important historic landmark in downtown Halifax. Have you ever visited a historic building that was later damaged/destroyed by Mother Nature? Let us know in the comments. St. Matthew’s has regular Sunday worship, including Sunday School. The church is also open to visitors on weekdays (free to enter). St. Matthews United Church, Halifax, N.S. What a beautiful church with lovely architecture. I work in “Halifax” industrial area – but it is not in Canada and it doesn’t have a church. Happy travels and thank you again for hosting. Hi Jill. HaHa…shows are British roots! St Mathew’s looks like a gorgeous church. I love wandering around churches and cathedrals given half a chance. I loved the story about the minister nodding off and waking with a start! Hi Johanna. Agree, churches are great places to wander through. Beautiful architecture… I love the colorful stained glass. They are beautiful stained glass windows Nancie. Those old timers in the congregation paid well for their uncomfy pews! It is beautiful from the outside. Hi Jan. I was amazed at how much they charged for pew rental! Churches really have some of the most amazing architecture and interior décor. I never pass up an opportunity to photograph a beautiful church and have a wander inside if able. This one in Halifax is particularly beautiful with an interesting history. Hi Kathy. I’m with you. Settled by the British, Halifax has its fair share of historical churches. I love churches like these. It may not be as ornate as those European ones but I love its rich history. That would have been quite a scene to see with all those people and their layers during service. I can’t get over how much those pews went for. 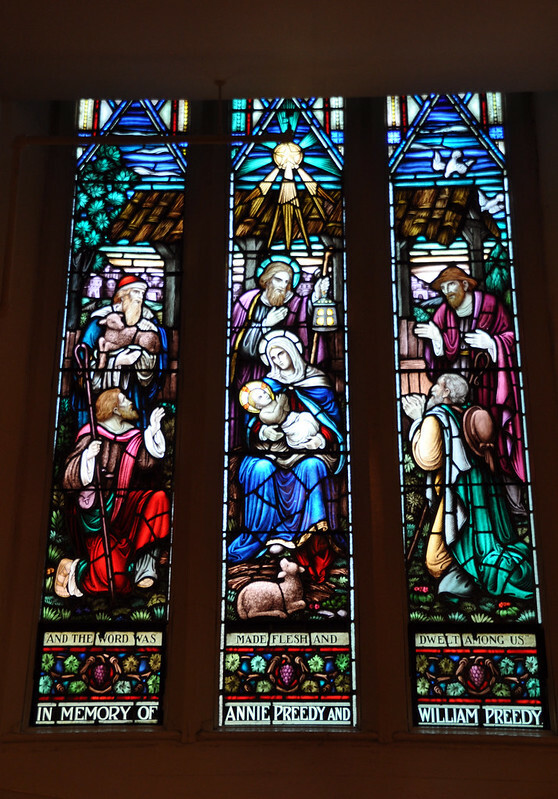 beautiful stained glass windows! One can easily underestimate the New World when it comes to things like churches because they can’t possibly be as old or grand as the churches in Europe. But you can find impressive churches big and small, and sometimes in the most unlikely of places. Hi Eileen. That’s so true. Having been settled by the British with such a strong Christian influence, there are quite a number of historical churches in Halifax. The church is so pretty, but I’m not sure if the stained glass would be enough to keep me distracted from the cold in the pre-stove days. I like authentic pipe organs and wished when I was growing up that my childhood church didn’t just have a “fake” one with synthesized pipe organ sounds. That story about Plain Jane is a hoot. Hi Michele. I am with you there. I hate the cold, and it would take a lot more than a stained glass window to keep me distracted. Pipe organs are nice! Wow. The pipe organ it’s amazing. The church windows are breathtaking. Great post. Poor St. Matthews! Yes I’ve visited Christchurch Cathedral which was severely damaged in an earthquake. As far as I know it is still half standing. Hi Jan. Yes, it is sad. The church also does a lot in the community. They run a homeless shelter and those people will now have to go elsewhere. I’m sure they’re resilient and with a little help from the community they’ll be back at it in no time. I do hope when the rebuild the steeple it’s a replica. Beautiful church and that pipe organ is gorgeous! That church is older than the Europeans founding New Zealand. I can’t really fathom going to a church in winter (in Canada) when it’s not heated. I do believe the story about poodles being used as foot warmers. The decoration of the organ pipes is quite attractive (I assume the restoration maintained the original colours). Oh, that’s too bad about the steeple being a casualty of the severe weather as your photo shows a beautiful and imposing church. I love your stories about the wealthy church goers bringing along their foot warmers and poodles. Hopefully, the minister of the church took pity on his parishioners sitting on the unforgiving pews and shivering in the unheated interior and made his winter sermons shorter! Very pretty church! 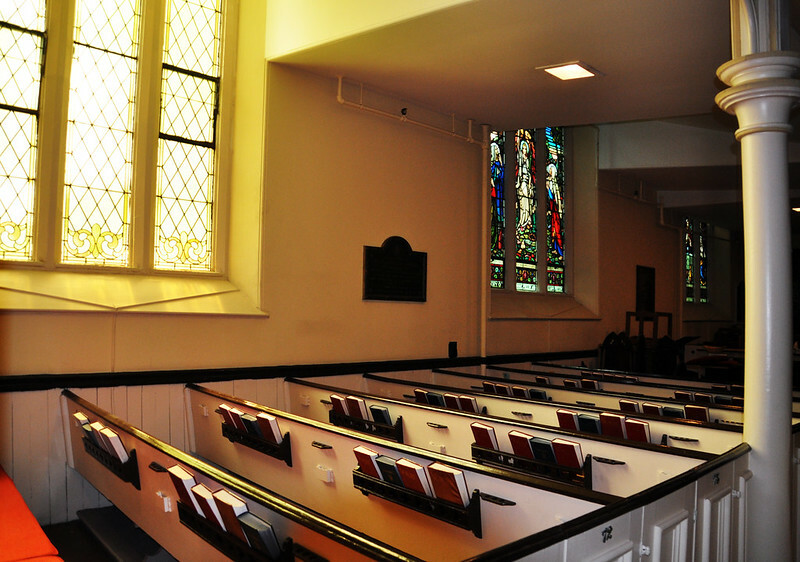 The facts about the pews remind me of a church I visited in Philadelphia. The seats were pretty much the same but you had to pay to sit. The closer to the altar, the more expensive. If you couldn’t pay, you had to stand up for the duration of the service. Interesting piece of history!